After an initial grounding in writing, courtesy of a London magazine publisher, Rose joined a major UK engineering group in its publicity department, initially as a PR writer and then as manager of the department. It was here that he first developed the ability to write about complex machinery and processes in a way that made them accessible to both engineers and non-technical readers. Subsequently he moved on to join one of the largest UK technical PR agencies, eventually ending up as Managing Director of its southern operation. He then set up his own agency specialising in engineering and technology accounts which numbered among its clients several of the largest industrial companies in the UK and Europe. Deciding that running an agency took him too far away from the business end of writing, Rose eventually down-sized, retaining some major clients but also branching out into writing copy for ads, video and presentations for companies in the UK and Europe. He then moved to the USA, returning to journalism on a freelance basis with the Lakeland Ledger, one of the largest daily papers in Florida, while also writing for major PR clients in the UK, USA and Australia. During his time freelancing for the Ledger, Rose wrote on topics as varied as the arts, education and entertainment, contributing as many as 10 by-lined articles per week. Rose returned to the UK to work in-house for a global engineering company as PR and marketing manager and also worked with other companies within the Group to improve the output and take up of press materials. 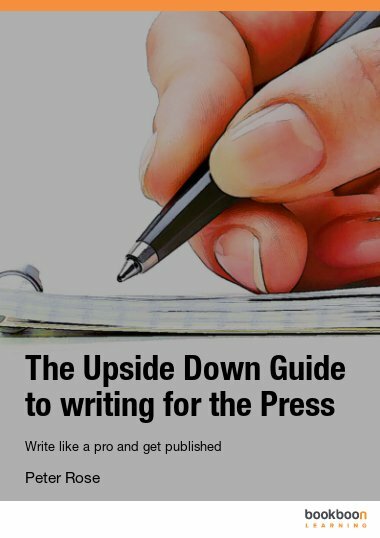 He is presently working as a freelance writer and has taken the first steps to authorship with his current book, The Upside Down Guide to Writing for the Press. He is also working on a book for children based on stories he told his daughter when she was a child. Peter Rose lives in Hampshire, England, is married to Patricia and has one daughter and a large slobbery dog called Lucy.